A specially formulated native mix that meets the conservation pollinator program guidelines for cost sharing. Contains ten native species for extended bloom time. Rate 15 lbs/A. Available in 1 lb quantity. Please call us for bulk prices on larger volumes. Planting guidelines sent with all orders. 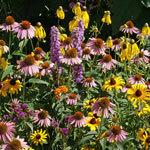 This mix is our specially formulated native wildflower mix with Little Bluestem grass. 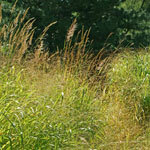 Often the conservation pollinator program requires the addition of a grass. We now offer this option for you. Available in 1 lb quantity. Please call us for bulk prices on larger volumes. Planting guidelines sent with all orders. A versatile wildflower that can be planted in the spring for early summer blooming or in the late summer for fall blooming. Mixture of papery thin pink, purple, and white blooms on feathery green foliage. Grows to a height of 4-5 feet in moist, full-sun areas. Use this wildflower for a color splash around your property or outbuildings. Available in 1 lb quantity. Planting rate: 15 lbs/A. 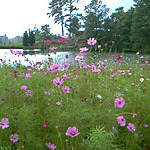 Our wildflowers are best planted in the fall in the deep south to allow the perennials to become established. In other areas of the country plant wildflowers in the spring. Prepare soil or ground by first mowing area low, then apply a burndown herbicide, followed by a light disking. Distribute seed mixed with a carrier onto the soil surface and cultipack or use a no-till drill and plant at a depth of 1/4 " if possible. Water area until seed germinate for best results. Nitrogen is not recommended at planting due to promotion of weeds; phosphate and potassium are beneficial and can be added at planting. Soil test pH should be adjusted to 5.8-6.2. � Copyright 2009-19 Wannamaker Seeds, Inc. All Rights Reserved.